CUT is a place that I've wanted to try ever since it opened last year. 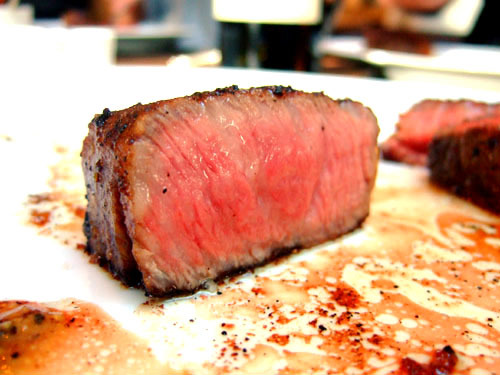 Steak and Wolfgang Puck - how could you not love it? I'm not sure what took us so long. Perhaps it was that reservations are fairly difficult to secure, hence the 5:40 start to the meal. Actually, we could only get a 5:30 seating, which we almost missed due to traffic since CUT only holds reservations for 15 minutes. 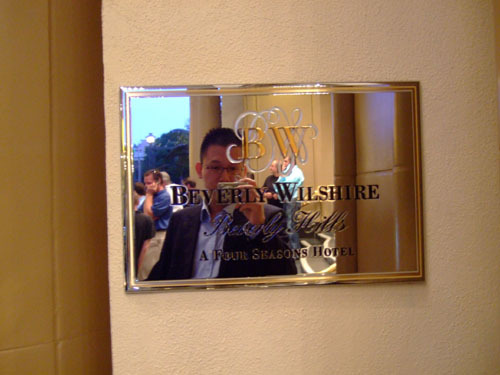 CUT is housed in the Beverly Wilshire hotel, which is now run by the Four Seasons. I would like to say that we arrived in the Rolls (the third we saw that day, along with four Astons, three Bentleys, three Ferraris, and a horde of new S-Classes), but then I'd be lying. 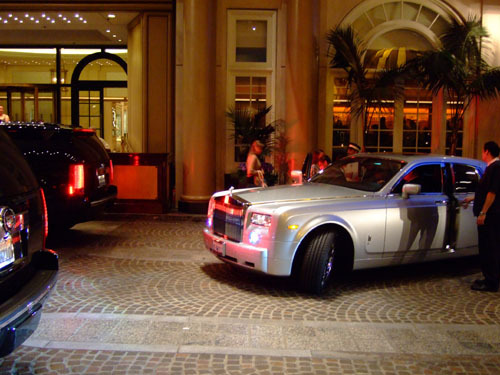 Actually, we may have been in the least expensive car there; that's how you know you're in Beverly Hills. The dining room is bright, airy, and modern. 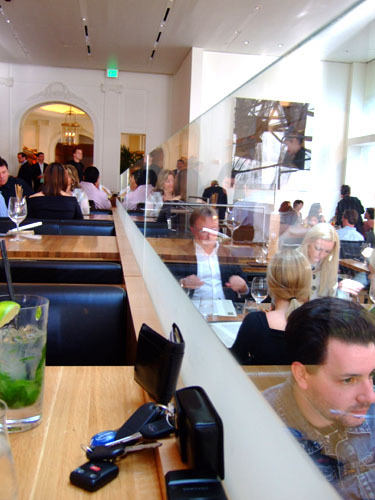 A glass divider separates two rows of extremely spacious booths, while the rest of the room contains a couple dozen tables. 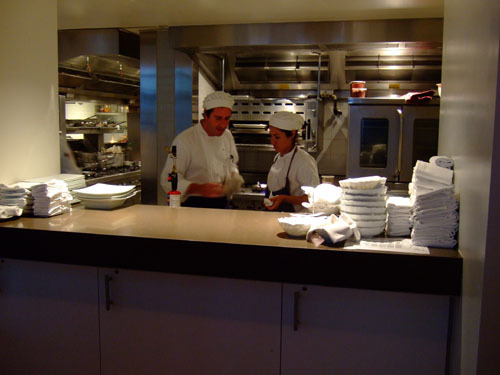 The open kitchen runs almost the entire length of the dining room. I loved the pomp and circumstance surrounding the presentation of the meat. Here, our server Dan shows us Japanese cuts of filet, rib eye, and New York, along with a Snake River Farms New York (in white). 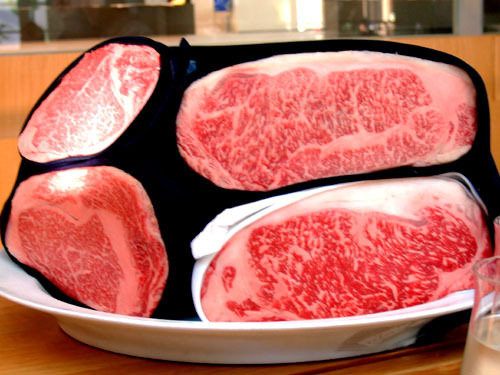 Note how much more marbling the Japanese New York has compared to its American counterpart. The dinner menu is fairly straightforward but presents the diner with a myriad of options (steaks, sauces, add-ons, sides). Note the signature of Executive Chef Lee Hefter. 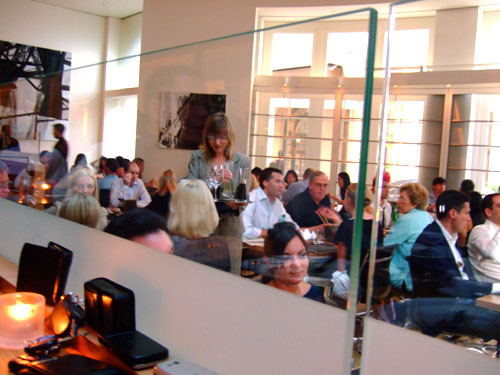 Hefter is also the head chef at Spago, and often travels in between the two on a given night (they're only 0.2 miles apart). 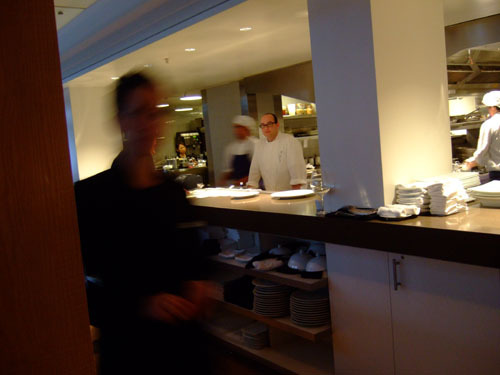 We didn't see him at our last trip to Spago (he was at CUT tending to S. Irene Virbila apparently), but were lucky enough to catch him this time right as he was heading out the door. 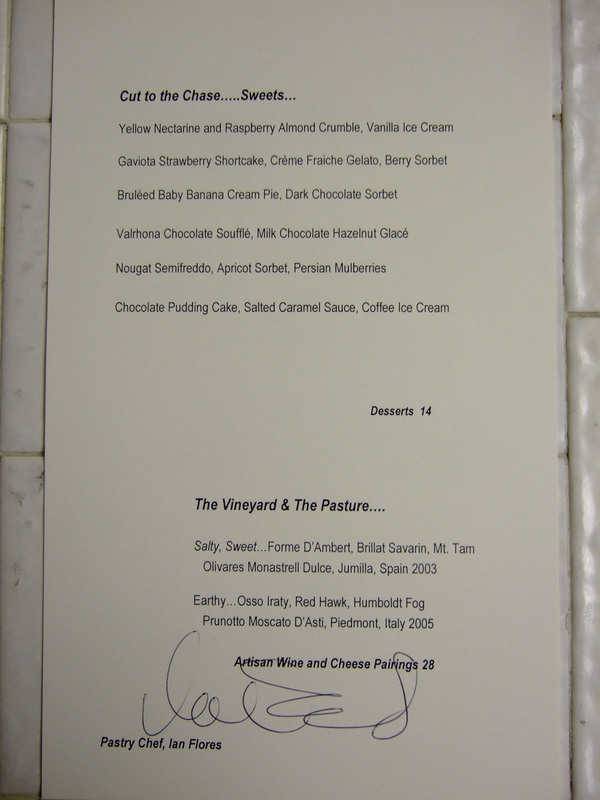 We also got the signatures of Chef de Cuisine Ari Rosenson and Pastry Chef Ian Flores. Click for larger versions. 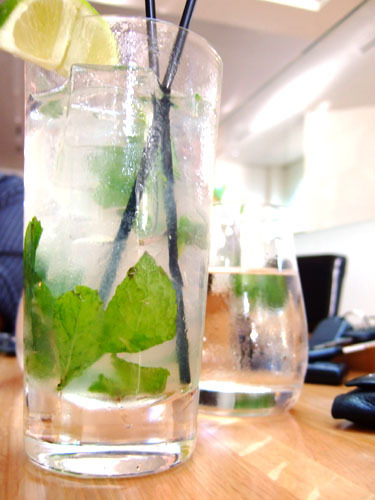 My signature mojito was well prepared, though not quite as good as I had at Spago. 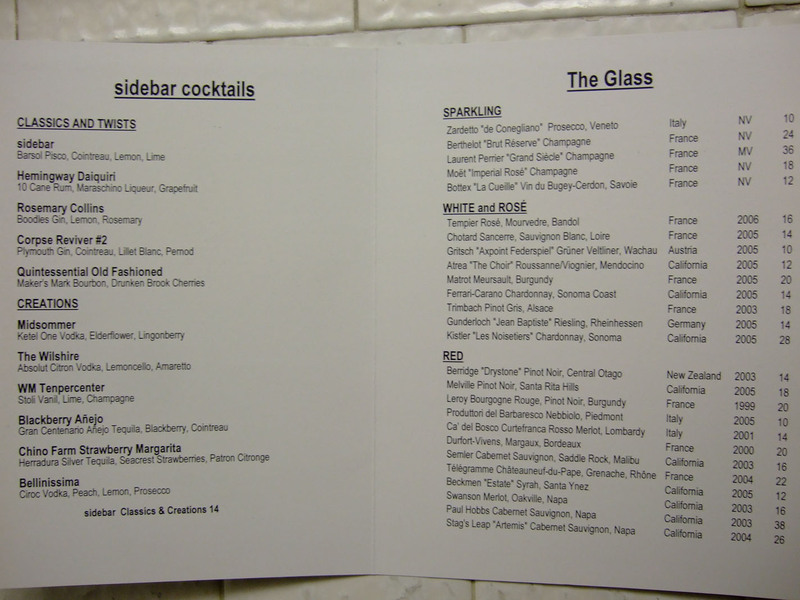 Click for a larger version of the drinks and wine by the glass menu. 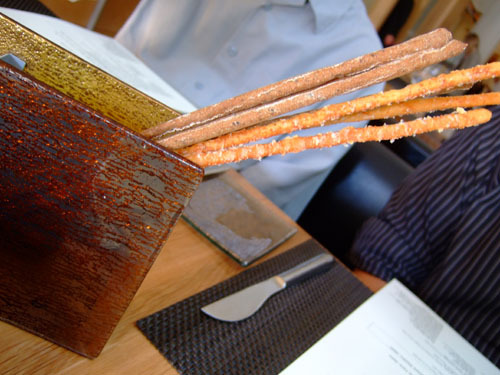 We started with some very tasty bread sticks and even tastier cheesy puffs. 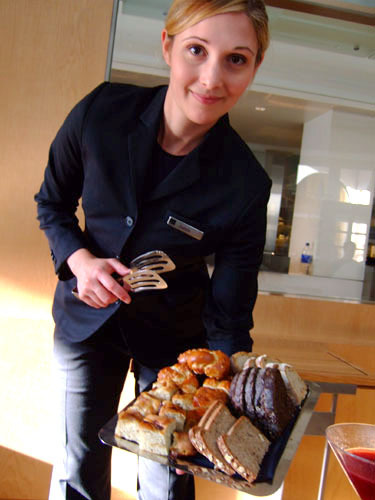 Five varieties of bread were offered: focaccia (my favorite), pretzel, pumpernickel, hazelnut, and sourdough. Herb Aioli, Mustard. A slightly contemporized version of a classic, with traditional accoutrements of onion, mustard, and egg. Probably the second best beef tartare I've had, behind Kevin Taylor. 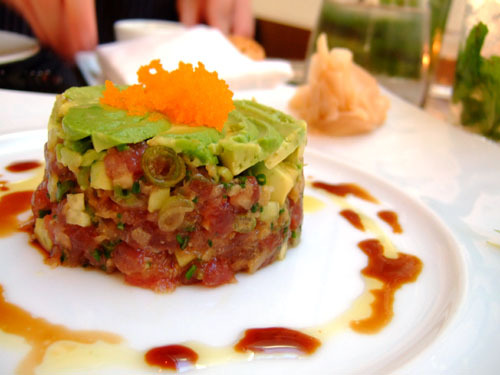 I kept going back and forth as to whether I liked this or the tuna tartare better. Wasabi Aioli, Ginger, Togarashi Crisps, Tosa Soy. I've had so many tuna tartares that the dish has become almost a bit clichéd. Fortunately, I'm happy to report that, quite surprisingly, this was an excellent preparation, very nicely flavored and augmented by the avocado and onion. Spicy Radishes. My favorite appetizer of the night, with rich, tender, beef foiled by slightly bitter greens and radishes. Superb. Spicy Tomato-Horseradish. 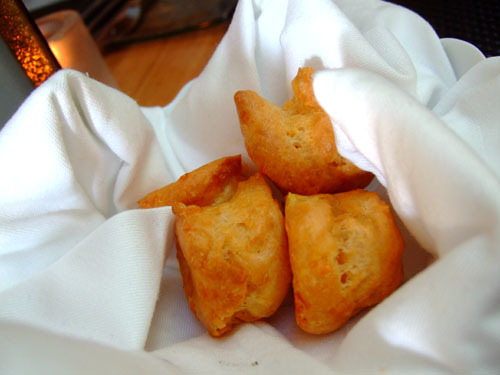 This was probably the weakest of the appetizers, but was by no means bad. I can't fault the quality of the ingredients, but the flavors just seemed a tad muddled to me. 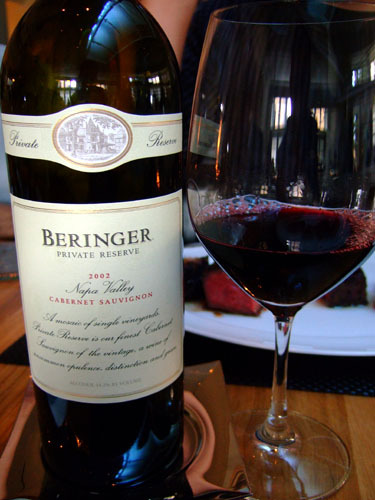 "94 points: The 2002 Cabernet Sauvignon Private Reserve may not equal the fabulous concentration and intensity of the 2001, but it's not far off the mark. It is a fruit-forward, softer, more flamboyant, already seductive effort displaying gorgeous notes of chocolaty creme de cassis, some spicy, high-quality, toasty oak, a rich, plush, savory, expansive mid-palate, and a long, heady finish with elevated glycerin and plenty of sweet tannin and fruit. This wine is delicious yet promises to age gorgeously for 15-20 years. Ed Sbragia compares it to the 1992 which, by the way, is drinking superbly in 2005, but is one of those rare vintages that has never gone through a closed period. It's always a fascinating education to taste through these component parts, but the resulting blend that Ed Sbragia puts together, the extraordinary Private Reserve, is one of the great Cabernet Sauvignons of California and he has fashioned a succession of beauties since 1991. In fact, there are two gorgeous ones in the market, the profound 2001 and the flamboyant, exotic 2002." 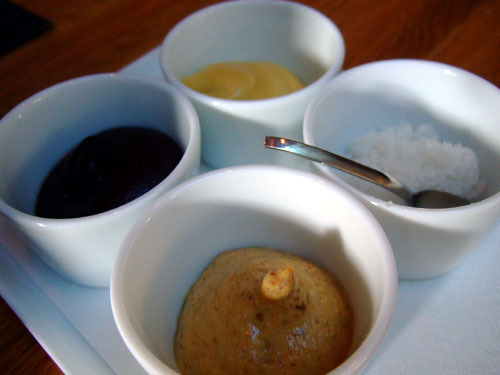 Four types of sauces were brought out with the steaks: fleur de sel, spicy mustard, violet mustard, and Dijon mustard. In additional, we added a Whole Grain Mustard sauce for $2 (not pictured). I'm not a fan of saucing steaks, so they were used very carefully. 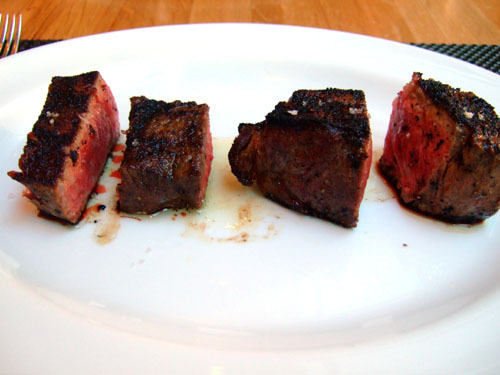 The pairings were good enough but the steaks easily stood on their own. 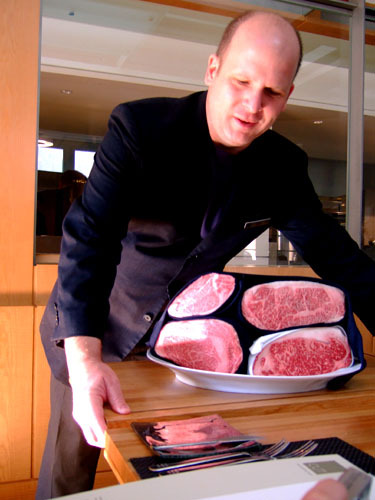 CUT offers four grades of beef: Japanese, Snake River, dry aged, and wet aged (in decreasing order of price and richness, and as shown above). This being our first trip to the restaurant, we wanted to try all of them, so we ordered New York cuts of all the types (since it was the only cut available in all four grades). Our server suggested that the beef be cut and served as a tasting of sorts. We then added a Japanese rib eye for good measure at the end. All steaks were cooked medium rare as per Dan's recommendation (which was spot on in my opinion). I included the prices per ounce below as an interesting point of reference. Bone In New York Sirloin 20 Oz ($2.55/oz). 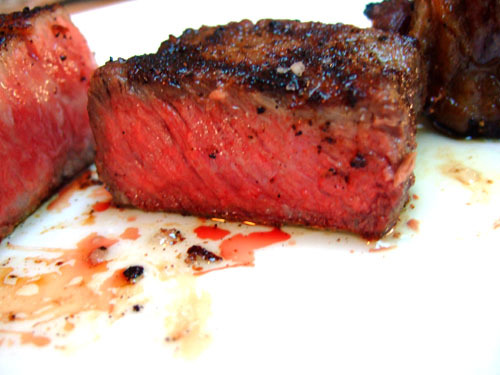 This is your standard wet-aged steak that you'd find at your typical high-end steakhouse (e.g. 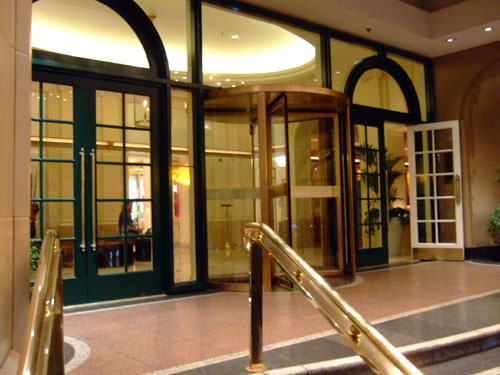 Morton's). Nothing wrong with it (in fact it was very good and only suffered in comparison), but it was outshone by its peers this night. 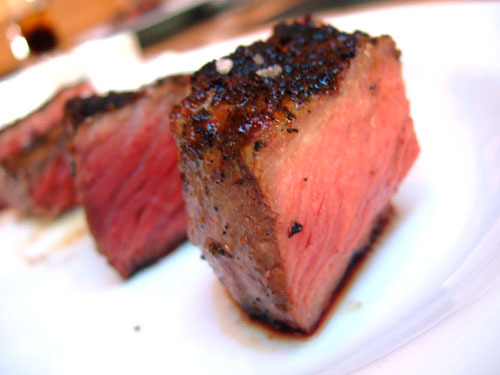 New York Sirloin 14 Oz ($4.14/oz). 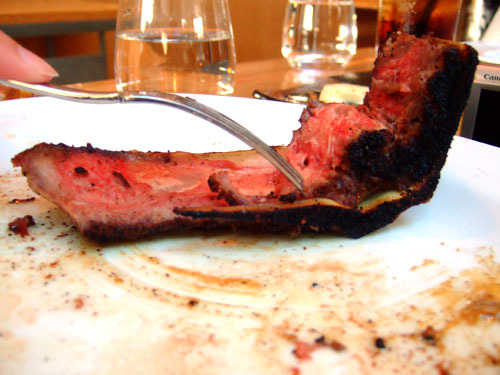 Dry aging results in large amounts of meat being thrown away, hence the increased price. 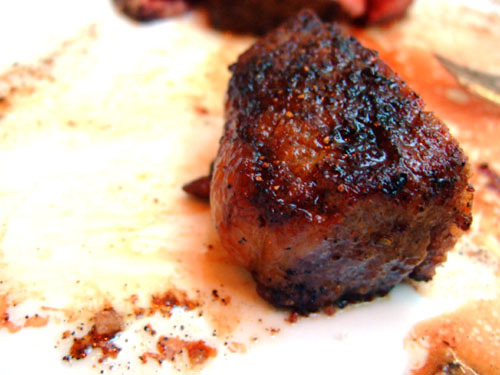 It's basically a process of controlled rotting that concentrates the meat's flavor. The result is a bolder, beefier taste that we all preferred to the wet-aged. I didn't note any huge differences in texture or mouthfeel however. New York Sirloin 8 Oz ($8.75/oz). Stepping up to the Snake River results in a big jump in price as well as richness, tenderness, and fattiness. 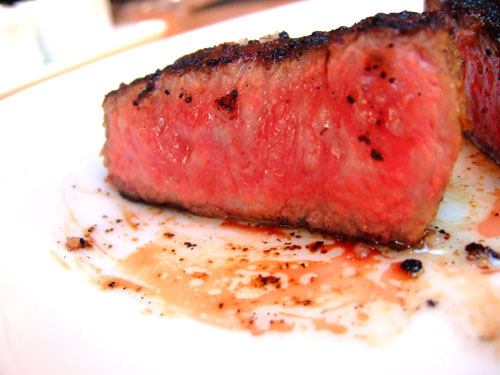 This is a nice medium between your standard steak and your Japanese variety. If I had to eat a large amount of meat, I'd probably go with either this or the dry aged. New York Sirloin 6 Oz ($20/oz). Now we get to the real deal. Marbling is kicked up a notch, which is evident in the photo above. 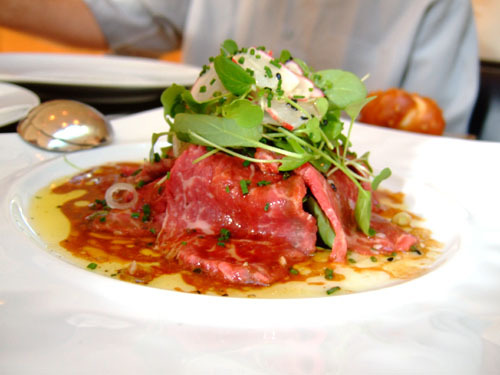 The beef is almost gelatinous in nature, and bounces and jiggles when tapped with a fork. 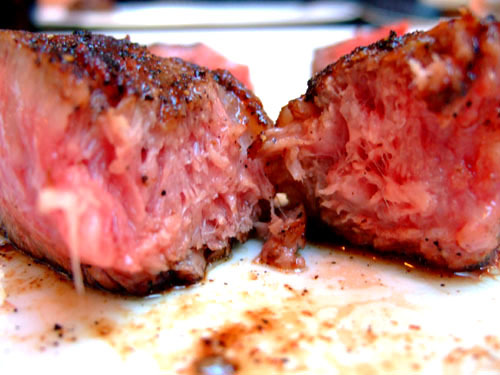 To me, there's a night and day difference between a standard steak and this. The one downside is that the meat's richness means that it's extremely heavy and filling. I'd probably want to limit myself to about 5 ounces. 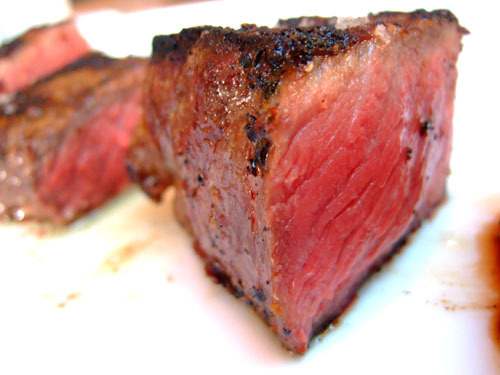 Rib Eye Steak 8 oz ($17.5/oz). We had the rib eye after having a bit of all the New Yorks. It was actually quite similar to the Japanese New York, but perhaps even a bit fattier. I'm not usually a fan of rib eyes, but this (along with it's New York counterpart) was probably the best piece of steak I've ever had. They were both simply wonderful. "100 points: There are 10,000 cases of this perfect sweet white Bordeaux. 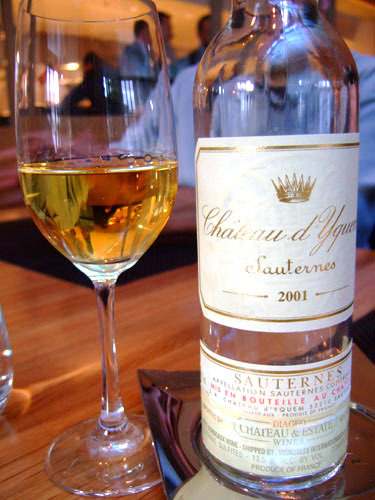 The 2001 Yquem reveals a hint of green in its light gold color. While somewhat reticent aromatically, with airing, it offers up honeyed tropical fruit, orange marmalade, pineapple, sweet creme brulee, and buttered nut-like scents. In the mouth, it is full-bodied with gorgeously refreshing acidity as well as massive concentration and unctuosity. 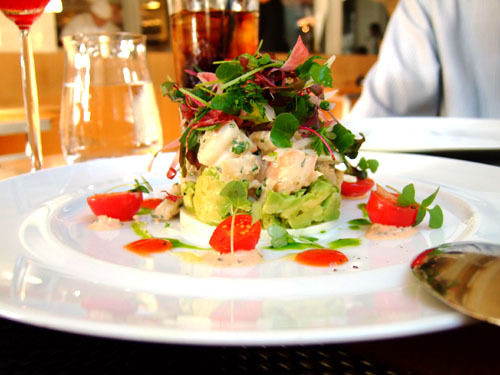 Everything is uplifted and given laser-like focus by refreshing acidity. This large-scaled, youthful Yquem appears set to take its place among the most legendary vintages of the past, and will age effortlessly for 75+ years. Anticipated maturity: 2010-2100+." Apricot Sorbet, Persian Mulberries. 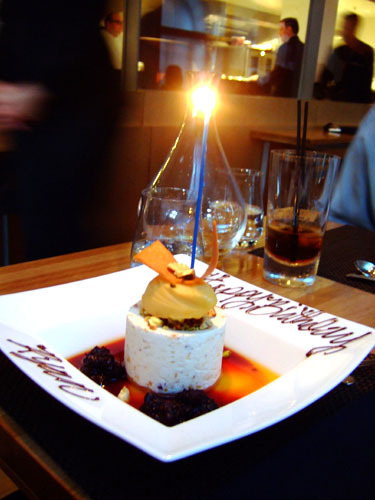 Done up in full birthday regalia, this was probably my favorite dessert. 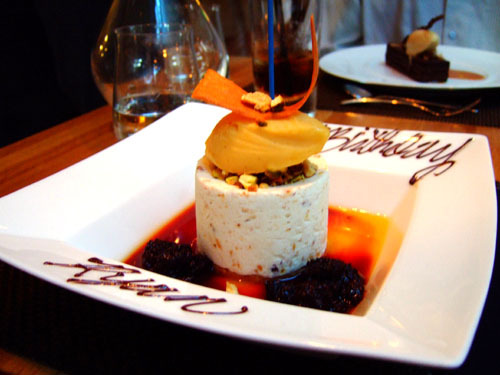 The semifreddo was quite rich and heavy, but was complemented nicely by the crunchy nougat and apricot sorbet. 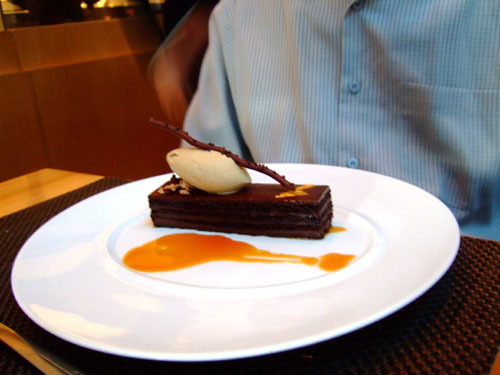 Salted Caramel Sauce, Coffee Ice Cream. The description of this seemed a bit boring to me but this dessert was surprisingly good. 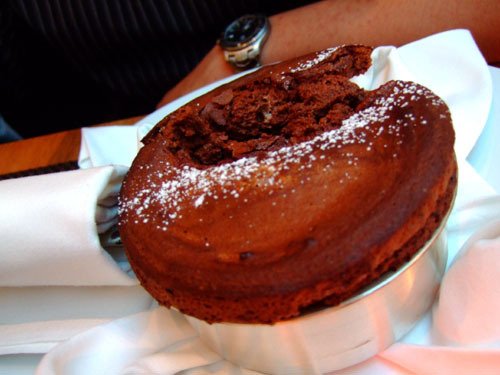 The ice cream provided a sharp contrast to the dense, rich cake. Milk Chocolate Hazelnut Glacé. 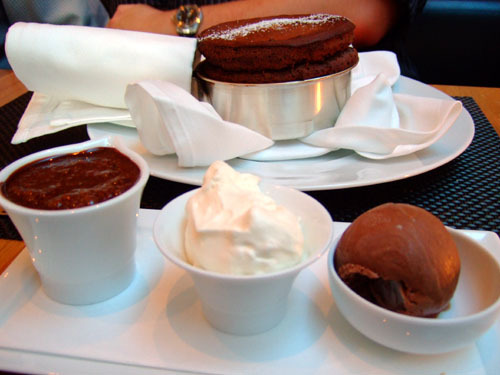 I'm not a huge fan of soufflés; but with that said, this was a pretty good example, not too heavy, a bit fluffy, and served with some nice accompaniments. Crème Fraiche Gelato, Berry Sorbet. 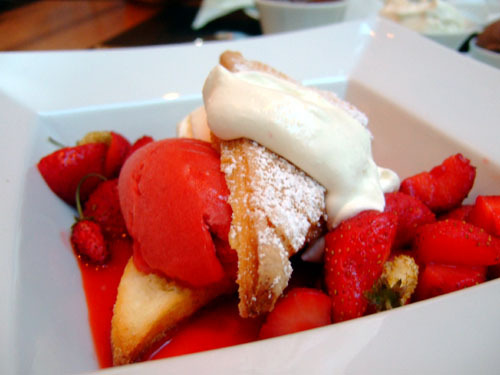 I really enjoyed this modern take on a classic dessert. 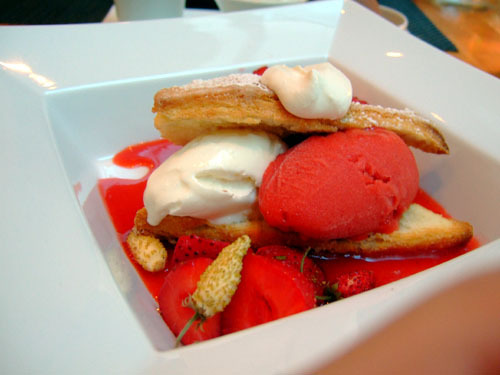 Amazing texture with the shortcake, and the interplay between the mild gelato and tart sorbet really worked. 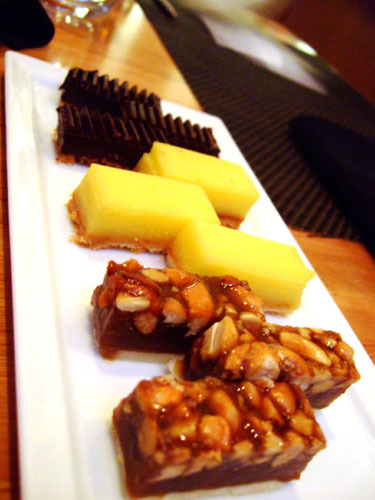 The meal ended with three mignardises: chocolate & Jack Daniels, yuzu, and caramel nut. I can unequivocally say that this is the best steakhouse I've ever been to. If you're a steak lover like me, CUT is a place that you can't afford to miss (even if you can't afford the Japanese Wagyu). i couldnt agree more. 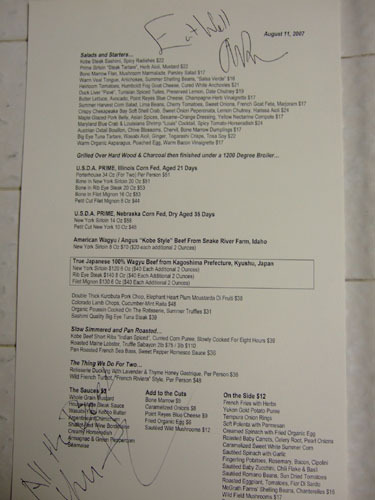 i had the american wagyu (not up to the 200 buck steak) and it was simply incredible. puts all other steakhouse to shame. rest of the meal was super too. Indeed. 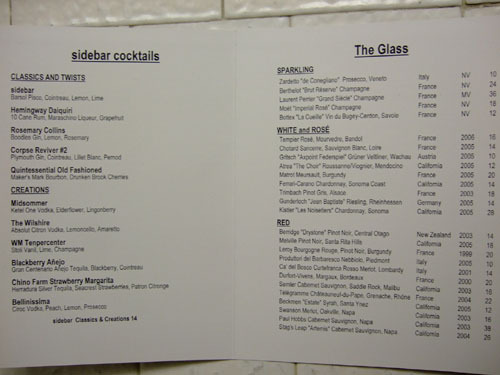 CUT sets the steakhouse bar for me. No other steakhouse even comes close in my opinion. Two new ones in LA I want to try are Wolfgang's and BLT. If you're looking for a more approachable Yquem I'd suggest the 02 split. Always great to hear about what you're pairing with the food. Thanks, will keep the '02 in mind. I believe I've had the Rieussec and Suiduiraut from that vintage but not the Yquem. The '01 was a bit tight indeed, and I still have two bottles I'm laying down. Not sure when those will be opened! oh my, oh my, oh my. I LOVE rare steaks !!! 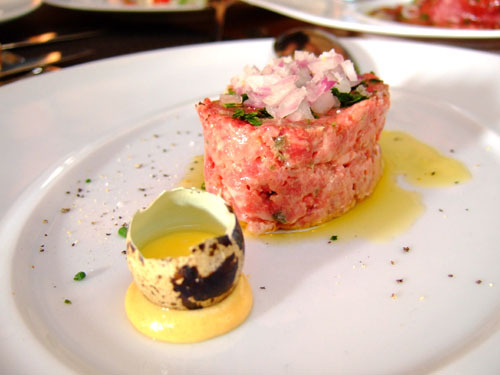 and steak tartare... My FAVORITE - I'm eating here within the next month !!! OMG - I think I'm in love. Will check Cut out next time I'm in town. 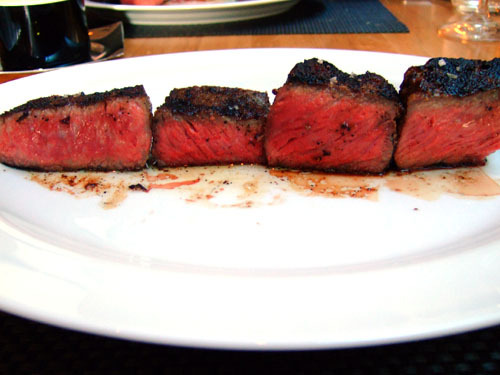 SteamyKitchen, CUT's definitely the place if you're in the mood for steak in LA! Thanks! 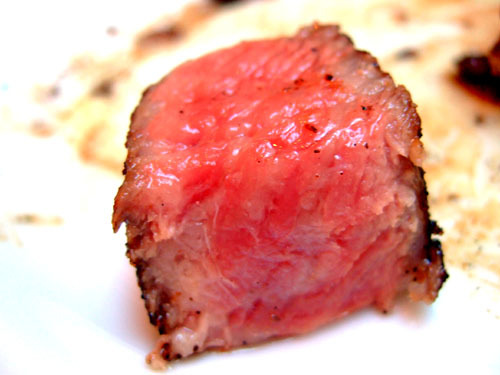 If you're into steak, you owe it to yourself to give CUT a shot. Enjoying your blog immensely. 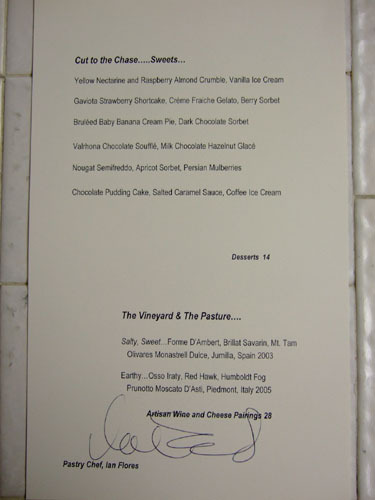 Visited CUT for the first (and only) time in mid January and started with the veal tongue salad, which was terrific. 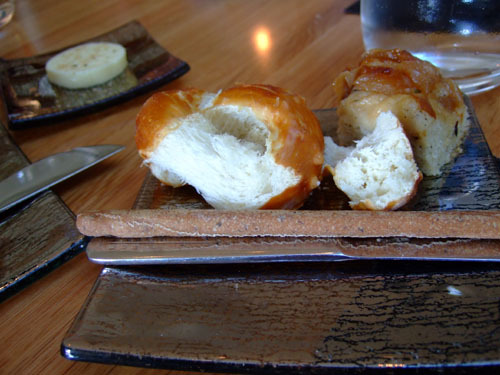 Bread selections were wonderful. I went for it with the 100% True Japanese Wagyu Filet Mignon, medium rare. Far and away the best steak I've ever tasted. It didn't need the Wasabi Butter sauce, but was an interesting complement. Frites as well were an excellent side. Nothing comes close. My sentiments exactly. Thanks Dan! So, is this legendary wine worth it for tomorrow? Or should we try something else? I don't they have the '01 Yquem on their wine list. We brought it in separately for this meal. We can certainly do another dessert wine though. Kevin, liked your post, can't wait to try CUT. I did want to clarify that the dry aging process slightly dehydrates the meat as well as enzyme tenderizing. The USDA still allows in the old by-laws for meat packers to dry age in a controlled environment over wood chips to abosorb moisture. A friend of mine sells the meat here.